Her Majesty the Queen cut the ribbon to launch the last great Clydebuilt Cunarder, Queen Elizabeth 2, and at 2.28pm on 20 September 1967 the elegant new liner began to move for the very first time. The venue was the world-famous John Brown shipyard at Clydebank near Glasgow which had built so many of QE2's illustrious predecessors, including legends like Lusitania, Aquitania, Caronia, and of course the original RMS Queen Mary & Queen Elizabeth. 40 years later on 20 September 2007, QE2 returned to the waters that bore her as the climax to her special round-Britain cruise celebrating the 40th anniversary of her launch. After a thrilling 23 minute tribute by the Red Arrows, at precisely 2.28pm, QE2's booming fog-horn sounded for 40 seconds to mark the moment she had entered the River Clyde 40 years earlier. On the promenade deck of the liner at Greenock, artist Gordon Bauwens fondly relived that memorable moment in 1967 when, as a schoolboy, he watched the ship slip gracefully towards him and thousands of other wellwishers gathered on the south riverbank to watch history unfold. With his wife and family, Gordon had been invited aboard for the 40th Anniversary celebrations on 20 September 2007 to perform signing sessions of his latest personal tribute to his favourite liner. 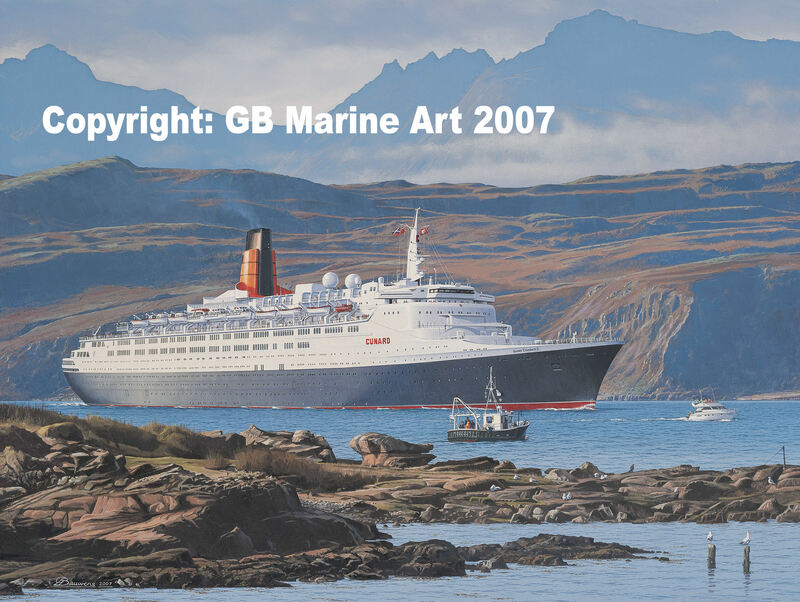 This was in the form of an oil painting reproduced as 400 Limited Edition prints showing QE2 amidst the glorious island scenery of the Clyde Estuary, heading towards Greenock early on the morning of the 20th. The highest mountains seen behind the ship are those above Glen Sannox on the Island of Arran at the foot of which are the measured mile markers used by the brand new QE2 as she ran her speed trials in 1969. This latest image is the 10th painting of QE2 by this Glasgow-born artist - the first recorded her launch 40 years earlier. QE2's career spanning 40 years of outstanding service elevated her from a mere replacement for Queen Mary and Queen Elizabeth into the world's most famous and best loved liner in her own right. She also became the longest serving Cunarder ever, the world's fastest passenger liner in service, the most-travelled ship in history (approaching 6 million nautical miles), and was probably the most commercially successful passenger vessel ever built. But more than all this, QE2 earned a special place in the hearts of ship lovers and sea travellers the world over like no other liner. Wherever she sailed, this elegant ship attracted large crowds of admirers eager to glimpse this unique maritime legend of our time. Following the sad announcement in 2007 of her planned retirement and sale, demand for QE2 memorabilia rose considerably. Few items are more collectable than these beautiful 40th Anniversary art prints, encapsulating all that the Grand Lady stood for - indeed, the main Edition has now sold out and only a few Artist Proofs remain for sale. Each is individually signed and dated 20 September 2007 by Captain Ian McNaught, QE2's final Master, who served on the 40th Anniversary round-Britain celebratory cruise and also on her final cruise to Dubai in November 2008. Captain Ian shares the artist's own deep passion for QE2, the world's most famous liner. 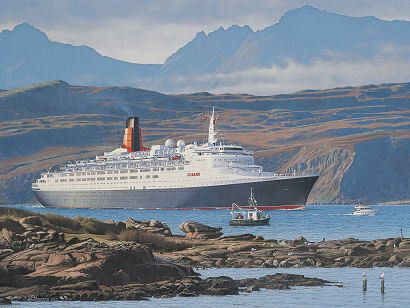 From an original oil painting of QE2 on the Clyde, 20 September 2007, the 40th anniversary of her launch. Ltd Edition of 400 prints and 40 Artist Proofs each signed and dated by QE2 Captain on the 40th Anniversary cruise and the Artist. Note: Ltd Edition & Artist's Proofs - sold out. Builders: John Brown & Co Ltd.